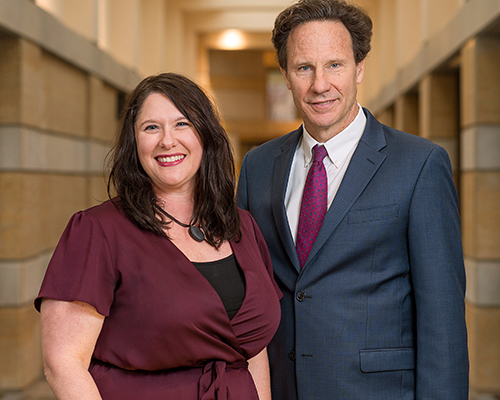 March 31, 2017 — Tracy Kijewski-Correa and Steve Reifenberg have been appointed co-directors of the Integration Lab (i-Lab), an innovative feature of the new Keough School of Global Affairs that engages students, faculty across disciplines, and partners around the world in addressing complex global challenges. Kijewski-Correa is the Leo E. and Patti Ruth Linbeck Collegiate Chair and Associate Professor, Department of Civil and Environmental Engineering and Earth Sciences, and Associate Professor of Global Affairs. Reifenberg, who has taught international development and served as Executive Director of the Kellogg Institute for International Studies since 2010, is Associate Professor of the Practice in the Keough School. The i-Lab will offer a theory-to-practice course each semester throughout the two-year Master of Global Affairs, beginning with the first class of students in fall 2017. Students will work in interdisciplinary teams with a “global partner” — a high-impact humanitarian, religious, or development organization, civil society network, government agency, or business, said Scott Appleby, Dean of the Keough School.